First, the bad news: When the Thomas Fire swept across the hills above Ventura last December, the Ventura Botanical Gardens, currently under construction, lay in its direct path. Much of the 109 acres that are the focus of the Gardens' master plan were burned. Now the good news: Restoration of vegetation, trails, signs, and other components is underway, and many of the plants themselves are slowly regenerating. 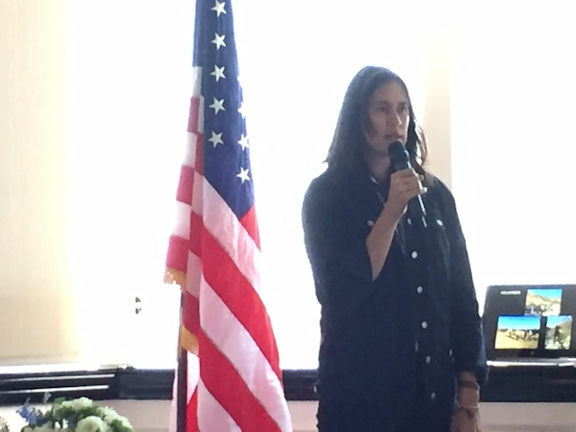 Nicole Horn (pictured above), a landscape architect with Courtney Jane Miller in Santa Barbara, provided details on the recovery efforts when she addressed members and guests of Ventura Rotary South at our March 26 regular meeting. According to Nicole, debris removal was first among the many tasks that will need to be completed in the restoration process, followed by mulching of the remaining vegetation to ensure its continued growth. Hillsides have already been hydro-seeded to stimulate new ground cover that will aid in erosion control. Replacement plants for those that were completely destroyed are currently being purchased. Additionally, the fire revealed some additional existing walls and structures that will be incorporated into the renewed design of the Gardens. Nicole also shared illustrations of several of the planned features of the Gardens, including the Welcome Center, nursery, amphitheater, and the Rotary Plaza, a viewpoint and seating area that will be constructed with the financial support of multiple area Rotary Clubs. If you would like to donate time or money to the Gardens' restoration and development, please visit venturabotanicalgardens.com. Thank you, Nicole, for an encouraging look at the process that is underway to surmount the setback of the Thomas Fire and bring the Ventura Botanical Gardens to reality!